Alpha-Stim® Technology – Begin Healing, Inc. Since 1981, Alpha-Stim has helped hundreds of thousands of people achieve remarkable results. 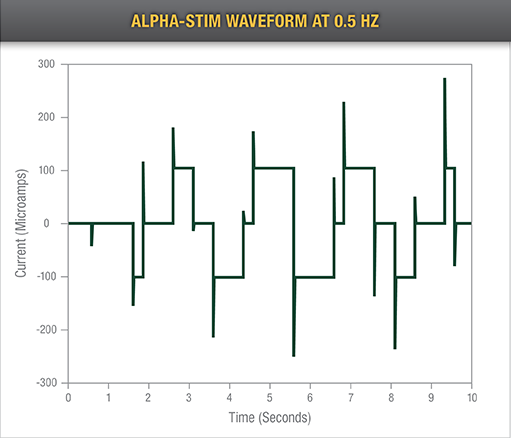 Alpha-Stim works by transmitting a unique, patented electrical waveform to modulate the cells’ signals to return to baseline, normal functioning—significantly reducing pain, anxiety, depression, or insomnia without medication. With Alpha-Stim, many people experience significant relief after a single treatment. With continued use, the effects of Alpha-Stim can be even greater, increasing cumulatively over time as cell function becomes more readily modulated. Alpha-Stim is supported by over 95 completed independent research studies and published reports that utilize some of the most rigorous, controlled clinical study methods. Again and again, Alpha-Stim has proven to quickly and safely provide relief from pain, anxiety, depression, and insomnia. Over a five year period, Alpha-Stim users can save thousands of dollars compared with drugs and other treatments typically used to treat pain, anxiety, depression, and insomnia. When you consider the results that are possible with the Alpha-Stim and the safety of the therapy, it’s clear why we believe there’s no better value available.